UltraTech International, Inc., leaders in the environmental compliance ￼industry have added the Ultra‐Hard Top P1 Plus to their product line. 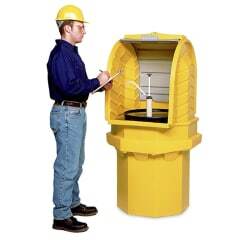 The one‐drum, outdoor spill ￼￼containment unit is the only product of its kind available on the market. The Ultra‐Hard Top P1 Plus rounds out UltraTech’s line of outdoor spill containment pallets. The company introduced a gull‐wing style two and four drum spill pallet more than 20 years ago and have since introduced several models and styles. With the introduction of this unit, UltraTech now has Hard Top Spill Pallets for one to twenty, fifty‐five gallon drums. The one‐drum spill containment unit is made in the U.S. with 100% polyethylene so it is unaffected by rust or corrosion and has excellent chemical resistance. The 70‐gallon sump meets EPA and SPCC spill containment regulations as well as NPDES, 40 CFR 122.26 stormwater regulations. Watch the video to learn more. Convenient "roll top" cover slides up and out of the way - allows quick access to drum pumps and funnels. Safe Handling - can be moved by forklift under the "shoulder" area or wheeled with the optional dolly.